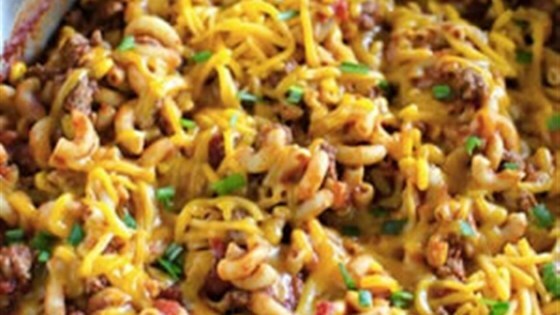 "This one-skillet chili mac is on the table in less than half an hour, and it's loaded with family favorite flavors." Cook and drain the elbow noodles according to the package directions; set aside. Brown the beef in a large skillet over medium heat. Drain excess grease. Stir in the Ragu(R) Sauce, chili powder, cumin, tomatoes and corn. Bring to a boil over medium high heat, cover,reduce to low and let simmer for 10 minutes. Stir in the cooked noodles and 1 cup of the cheese until melted and heated through. Sprinkle the rest of the cheese evenly over top, heat on low until melted. Serve immediately. Easy and delicious. I added more cheese though because, ...cheese. I subbed a pkg of taco seasoning mix for the spices and a can of tomato sauce for the diced tomatoes because we don't like chunks... Kids and hubby had seconds. I will make again. This was excellent... Didn't change a thing but if I were to, I would use crushed tomatoes, the tomatoes are a little chunky. I will make this all the time. Thanks for a great dish! Good simple recipe! Used reg canned diced tomatoes and grated some fresh jalapeño into it, worked fine. This was a great easy weeknight meal, with tons of leftovers!